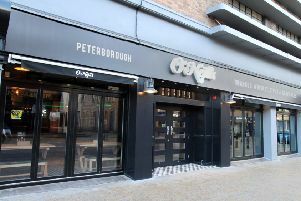 Peterborough’s latest day/night venue opens on Friday aimed at those who love the finer things in life. Harry’s, a stylish bar and café, has been taking shape in a refurbished part of the Solstice in Northminster, the concept of Mary McParland, whose parentsMichael and Eileen Boyle own the venue. Seeing a gap in the market between the city centre’s food orientated restaurants and booze-led bars, her vision was to provide a beautiful environment - she came up with the colour scheme and decor - where the “whole family could enjoy a fun and elegant afternoon or evening”. There will be fresh pastries and coffee to go from 8am for those on their way to work, snacks all day, afternoon tea, not to mention a selection of premium beers, wine and champagne. “Over the past couple of months we have been building Harry’s to give the people of Peterborough that something extra special that you won’t find anywhere,” she said. “The venue is aimed at those who love the finer things in life with our afternoon tea menu served daily, Monday to Saturday from 11am to 5pm, and Sunday from 12pm to 5pm. “We also offer a fantastic coffee and pastry take-away menu for those in the city early doors from 8am, Monday to Friday. To find out more about Harry’s Bar Café like the Facebook page ‘Harry’s Bar Café’ or got to www.harrysbarcafe.co.uk.